Being Upright takes us beyond the conventional interpretation of ethical precepts to the ultimate meaning that informs them. 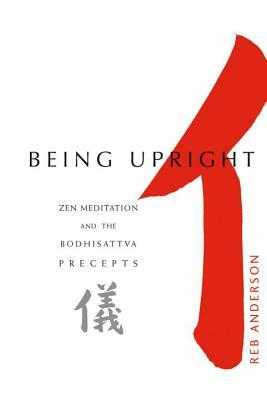 Reb Anderson first introduces us to the fundamental ideas of Zen Buddhist practice. Who was Shakyamuni Buddha and what was his central teaching? What does it mean to be a bodhisattva and take the bodhisattva vow? Why should we confess and acknowledge our ancient twisted karma? What is the significance of taking refuge in Buddha, dharma, and sangha? The author explores the ten basic precepts, including not killing, not stealing, not lying, not misusing sexuality, and not using intoxicants. A gifted storyteller, Anderson takes us to the heart of situations, where moral judgments are not easy and we do not have all the answers. With wisdom and compassion, he teaches us how to confront the emotional and ethical turmoil of our lives. Reb Anderson moved to San Francisco from Minnesota, in 1967, to study Zen Buddhism with Shunryu Suzuki Roshi, who ordained him as a priest in 1970. Since then, Reb has continued to study at San Francisco Zen Center, which includes Beginner's Mind Temple at The City Center (San Francisco), Green Dragon Temple at Green Gulch Farm (near Muir Beach, California), and Zen Mind Temple (Carmel Valley, California). Reb served as abbot from 1986 to 1995 and is now a senior dharma teacher.